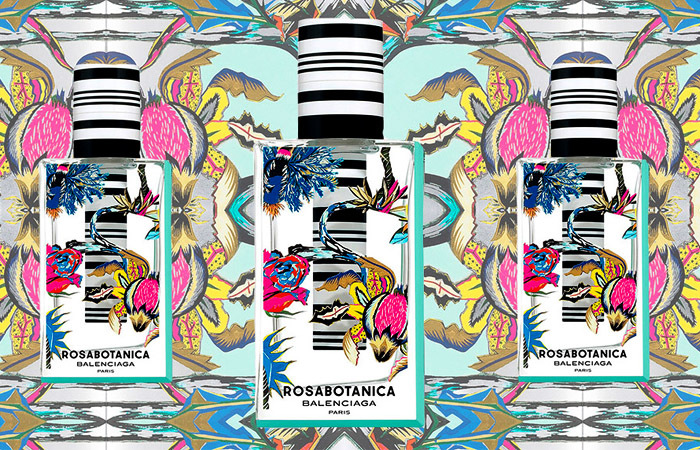 Rosabotanica opens all spicy and spiky with pepper, fig greens and rose. There’s a lot going on in the initial stages – sour fruits, sticky rose and lots of spice – but the effect is not cacophonous, in fact it’s remarkably well proportioned allowing for clarity between all of these disparate elements and tying them together with the bold central accord of a purple rose cast in many shades. 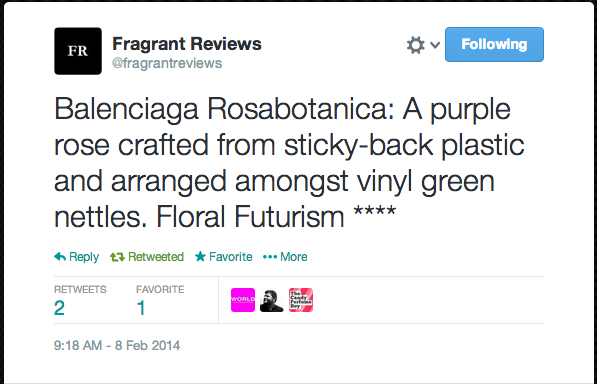 In my @fragrantreviews review of Rosabotanica I used the term ‘Floral Futurism’ to describe the scent, due to the fact that to my nose, this botanical rose is one crafted from sticky-back plastic and grown in a laboratory rather than naturally cultivated in a greenhouse. This space-age take on rose is wonderfully unique, but it’s also very wearable and balances the clash between spiky greens (the botanical) and test tube roses (the futuristic) beautifully. It really is nothing short of exceptional. Rosabotanica becomes much lighter in the base, relying on white musks to carry the green and rose facets right through to the end. Not a huge amount changes in terms of how it smells (it’s relatively linear) but things become much more transparent and wispier with time. If I was being picky I would say that a little bit more development and a stronger emphasis on something a bit more robust (I cannot find the woods or amber) in the base would fit nicely, but Rosabotanica is very nicely done overall so it seems a bit mean to split hairs. I was suitably impressed by Rosabotanica. It reminds me of the cool spicy rose of Marni but placed within stark green foliage for good measure. As far as roses go this one is pretty unusual and for that reason I think it’s worth a sniff, especially when compared to the designer fare with which it will be competing. Rosabotanica is also a damn sight more memorable than its sister scent Florabotanica, which may no be a mean feat in itself, but goes to show that this is a very worthy offering from the Balenciaga brand indeed. Balenciaga’s Rosabotanica is available in 50ml (£53) and 100ml (£75) Eau de Parfum. Sample via Escentual (I write for Escentual as their Fragrance Expert and am therefore affiliated with them – my views however, are my own.) Notes via Basenotes.net. Image 1 via gossip-dance.blogspot.com. Image 2 via thedieline.com. Quotes via Fragrantica.com. Posted in Balenciaga, Feminine, Flanker, Floral, Perfume Reviews, Rose and tagged Balenciaga, Feminine, Flanker, Florabotanica, Floral, Jean-Christophe Hérault, Kristen Stewart, Oliver Cresp, Perfume Review, Rosabotanica, Rose. Bookmark the permalink. So many really nice, cheaper perfumes fall down on the base. It’s such a shame but I guess the money runs out. Love that bottle. I always wonder why brands don’t do more imaginative designs. Yup! I suppose they think people wont get as far as the base before re-spritzing and certainly wont get anywhere near it when testing it in store. Still, the rest of scent more than makes up for it! Kirsten looks so bored on that ad! I quite like her intrinsic face, but it could definitely do with a slap. The bottle looks amazing and it sounds like an interesting mainstream fragrance as well. Am definitely going to give it a try. Kristen Stewart looks slightly bored but better than she did in the Florabotanica ads. Both the bottle and scent get a thumbs up from me. Kristen is an unusual choice I guess – pretty but bored. Idk why anyone would hire Kristen Stewart to be the face of their brand. She’s not good at flaunting this perfume. She’s so bad at promoting that she actually makes me despise the perfume! She seems to provoke very strong reactions! I think she’s a bit awkward, especially in interviews about the perfume. Your review of the scent is spot-on, perfection! I’ve sprayed a little of the sample I have, and it is very green fig, a little rose-y and peppery. The rose [an abstract green-rose] still shows up here-n-there like a rotating merry-go-round but a very green, woodsy scent with a tiny, slightest bit of creaminess as a last-ditch effort…a definite unisex scent, at least to me. I may purchase a small bottles worth. Thanks, Richard! I’m so glad that we’re on the same page with this one. Your description is great! I’m certainly tempted by a little bottle too.